BPS Research Digest: Mirror writing: What does it reflect about how we all write? Mirror writing: What does it reflect about how we all write? Our story starts with a wheeze: a schoolboy punished with lines saves time by wielding two pens at once. Exploring the ease with which he can play with writing, what began as a diversion eventually becomes an artistic practice that incorporates mirrored and inverted script into paintings. What can investigation of this skill offer to science? 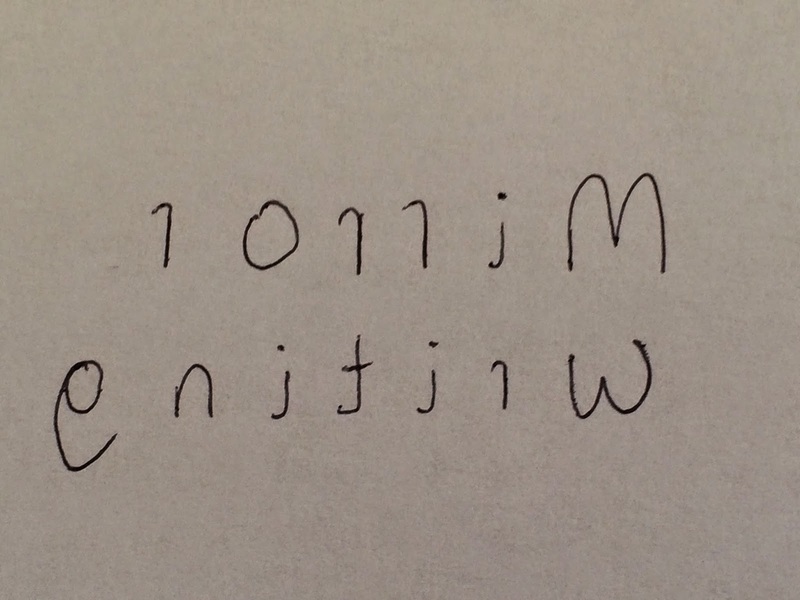 Mirror writing in Western script flows from right to left, writing first A, then l, e, x to produce xɘlA. It's reported both in neurologically impaired patients and healthy practitioners such as Lewis Carroll, Leonardo da Vinci, and our own case participant, 65-year old "KB". This phenomenon is no mere curiosity. It challenges popular theory that says we have a mental programme for writing that represents the act step by step, from start to finish; a programme most practised with our dominant hand, but abstract enough to be available by other means. This account has empirical support: when we write from our shoulder to mark a large canvas, some handwriting flourishes are still preserved, and this is true even when we grip a pen with our teeth! The standard theory predicts that writing with our non-dominant hand would be somewhat awkward, and non-dominant mirror writing extremely so: the work of using an unpractised hand compounded by the additional need to remap this high-level recipe. But the mirror-writing evidence simply doesn't agree. Comparisons of static script produced by right-handed individuals with mirror-writing competence (such as KB, although his handedness is not clear-cut), shows that the closest thing to their normal handwriting (with their dominant hand) isn't normal left-hand, or even mirrored-right, but mirrored left-hand script. Now a team led by Robert McIntosh have gone further (pdf), using an electronic tablet to record the order, timing and nature of individual strokes of KB's stylus. In terms of accuracy, speed, and similarity of stylus-strokes, they found that KB’s mirrored-left writing is the best match to his natural writing, confirming and strengthening the data to date. Perhaps KB's mirrored left-hand writing is so assured simply because it's the most practised. To address this, the researchers looked at upside-down writing, a much more recent addition to his repertoire. Left-mirrored was again the best match to right-forward – even though neither look that similar to upright right-forward. This new investigation with KB supports the idea that writing is not stored as universal coordinates, but instead as movements relative to body position: a capital "A" beginning with an "up and away from the body" pen-stroke. This is why writing with our non-dominant hand is awkward, as every stroke violates these principles, even though its output is "the right way around" perceptually. Indeed, mirror-writers including KB show little fluency or appetite for reading mirrored text, suggesting that motor and perceptual representations of writing are rather different. KB is part of a small breed - the deliberate mirror-writer - and McIntosh's team are interested in taking this methodology to other populations, both healthy and neurologically impaired, to see whether this vision of mirror-writing is reflected elsewhere. McIntosh RD, De Lucia N, Della Sala S. (2014) Mirror man: a case of skilled deliberate mirror writing. Cognitive Neuropsychology. Mirror-writing: Robert D. McIntosh and Sergio Della Sala explore some intriguing phenomena (in The Psychologist magazine). Your brain unscrambles words in the mirror but then switches them back again. This is interesting. Positive changes need to happen in every institution on every level, only then will we be able to appreciate cooperation and leave it for the future generations. Its an interesting article, the complex research was broken down into simple words. I am a patient who is currently a victim of sexual abuse by my therapist. I feel so alone and vulnerable and afraid. I am trying to cope with it and it is HELL. I feel so sucked in by it and I find I hard to get away again from him. Yet I blame myself for it constantly and now he has decided to 'act' professional and not do the things he used to in therapy I feel so rejected and scared and desperate to lose him. I just don't know how I am going to get through this because I feel afraid every time he mentions he is leaving or rejecting me again. Well written article that was totally accessible to this business owner. It's difficult to effect change in institutions, but one person can make a difference. Play it forward. This is a very great article. I never knew about it until i landed on www.reliablepapers.com. we're hard-wired for sympathy since agreeable conduct permitted our predecessors to get by under brutal conditions. Be that as it may, the majority of us understand that when we endeavor to give without desires of correspondence, we feel satisfied and empowered.